Review: This was a disappointment. I was expecting a better version of the Moisture Mist, but this pales in comparison. I've used a third of the bottle: it wasn't moisturizing for me, did not detangle, define or tame my hair in the least. No luster either. It isn't a greasy product, but it felt like a coating; it didn't penetrate. The fragrance doesn't match the rest of the line, it's more floral than the other products. I use this now to dampen my hair before applying other products, but I'll only do so if I'm near wash-day. If you've noticed, hibiscus isn't in the ingredients list. I contacted the company a few months ago, and they responded that it was a labeling error. I'm not sure if it's been corrected as yet. One thing I did like about this product is the packaging: the nozzle sprays a fine mist. 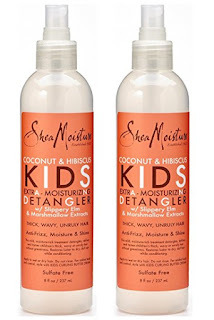 The Extra-Moisturizing Detangler is marketed as a children's product, and while I'm certainly not a child, I do have hair. I pick products based on what my hair likes/needs, not a company's marketing. The ingredients here look great, but the formulation just wasn't for me. I'll stick with the Moisture Mist. 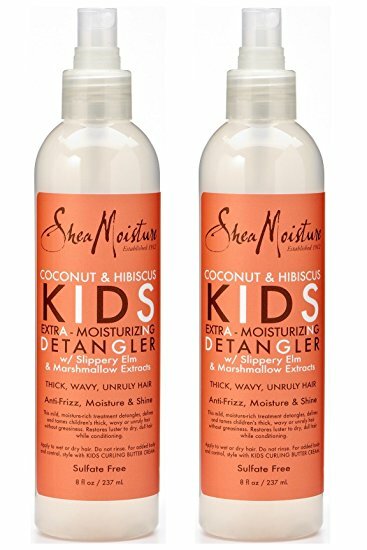 Shea Moisture Coconut & Hibiscus Kids Extra-Moisturizing Detangler is sold in select Target stores and retails for $9.99 (8oz).